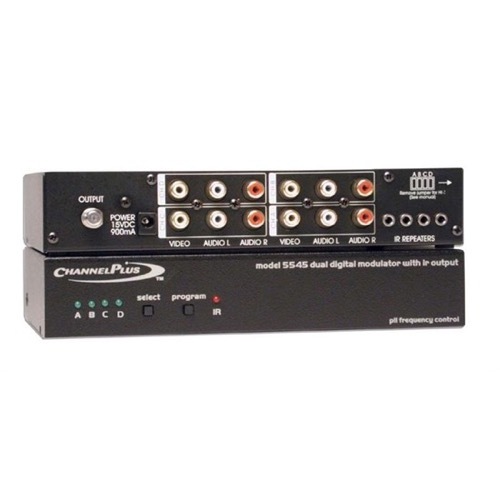 The Model 5545 Four-channel Video Modulator with IR converts four video and stereo audio inputs to four programmable TV channels (stereo audio is converted to monaural audio after modulation). The Model 5545 has IR emitter output jacks and the ability to remotely power a DA-8200 or DA-550 series distribution amplifier from up to 75' away. The Model 5545 works with both the 12-volt and 5-volt IR systems and accessories. The Model 5545 modulator offers video loop-through. Jumpers on the Model 5545 terminate the video inputs at 75 ohms. When a jumper is removed, the input can be looped using a "Y" adapter to feed the video to a local monitor or VCR.